Hassan Ali Kheyre – Somalia Prime Minister – UN General Assembly – 22nd September 2017. Sushma Swaraj - Minister of External Affairs for India - UN General Assembly - 23rd September 2017. Lyonchhen Tshering Tobgay – Prime Minister of Bhutan – UN General Assembly – 22nd September 2017. It is no surprise that British Prime Minister Theresa May mentioned the word terror(ism/ist) 19 times during her 20 minute speech on the 20th September 2017 at the UN General Assembly. Leaders across the world have been calling for a united approach to terrorism. As with climate change, terrorism has truly become on the top of the global agenda. While criminal acts such as genocide, crimes against humanity and war crimes have been enshrined in international criminal law through various treaties and conventions, there is no international convention on terrorism. Not all states agree on what terrorism means. “Perhaps the only honest and globally workable definition of terrorism is an explicitly subjective one – violence I don’t support.” J.V. Witbeck. “Terrorism is what bad guys do.” B. M. Jenkins. Yasser Arafat’s speech marks one of the problems with defining terrorism: one man’s terrorist is another man’s freedom fighter. The lack of a common definition is a concern for me. It hinders a global co-operative strategy to counter terrorism that Prime Minister Lyonchhen Tshering Tobgay passionately called for. It hinders establishing a basis to combat terrorism. In the Rome Statute establishing the International Criminal Court, genocide is “acts committed with intent to destroy, in whole or in part, a national, ethnical, racial or religious group.” Legal instruments for genocide are the Rome Statute and the Genocide Convention. When two states are party to a treaty, they mutually agree on the definition of the term genocide in accordance with the treaty. There is no such legal instrument for the definition of terrorism. We will shortly be looking at what legal instruments exist to combat terrorism. It is a problem that multiple people, organisations and states have different meanings of terrorism. Before we look at what definitions are out there, let us look at an event with different words used about the event. On the 2nd October 2017, on one of the days I am writing this article, I woke up to the news of a mass shooting in Las Vegas. At the time of writing, reports show 59 people have died, and 527 people have been injured to a lone wolf killer named Stephen Paddock. He opened fire on the 32nd floor of the Mandalay Bay hotel on a country music concert. The President of the Republic of Turkey called it a terror attack. The musician Lady Gaga, with her global influence defined it as terrorism and the well-known journalist Piers Morgan called it a terrorist attack. These three tweets reached over 88 million people worldwide. That is three people calling a mass killing an act of terrorism. Are they all wrong, or are they indeed correct that this was terrorism? Right or wrong, qualified or not to speak of terrorism, we cannot escape the fact that those tweeting have a global reach. With a universally agreed definition of terrorism, we are able to say “yes you are correct in that definition, and have gave 88 million people the correct information.” Or "no, you are wrong, that definition is incorrect. It is a mass killing, it is an atrocity, but it is not terrorism." How did other leaders respond? Putin called it a “crime that took the lives of dozens of civilians”, May called it an “appalling attack”, Trump called it a “terrible shooting”, Obama called it a “senseless tragedy”. German Foreign Minister Sigmar Gabriel called it a “massacre.” None of them called it terrorism. The closest we are currently to the definition of terrorism surrounds the financing of terrorism. The International Convention for the Suppression of the Financing of Terrorism 1999 (ICSFT) is the closest we have to global co-operation. Out of 193 member states of the United Nations General Assembly, currently 188 states are party to the convention. Article 2.1(b) of the ICSFT contains an implicit definition of terrorism similar to the one proposed by Kofi Annan in 2005 which was not adopted. I will look at Kofi Annan's efforts later. This means if the perpetrator of the mass killing in Las Vegas intended his act to intimidate a population, or compel a government or an international organisation to do or to abstain from doing any act, I would agree that it was an act of terrorism. If not, then it was not an act of terrorism. According to this, the mass killing in Las Vegas does consitute as terrorism. The act of violence intended to cause great bodily harm and death to the population, and therefore can be argued, in accordance with Nevada law, to be an act of terrorism. The bodies at the United Nations combating terrorism are either created through the Security Council or General Assembly. The United Nations Security Council Counter-Terrorism Committee, a subsidiary body of the Security Council, was created by resolution 1373 in 2001 to address the threat of terrorism in a global and co-ordinated manner. Counter-terrorism Committee Executive Directorate (CTED) from resolution 1535 (2004) for monitoring states’ implementation of resolution 1373 (2001). Security Council Committee pursuant to resolutions 1267 (1999), 1989 (2011), 2253 (2015) concerning Da’esh, Al Qaida and the Taliban. Analytical Support Monitoring Team pursuant to the above resolutions. Non-proliferation Committee established under resolution 1540 (2004). Working Group on the victims of terrorism under resolution 1566 (2004). The structure of the UN in its implementation of a global counter-terrorism strategy can be seen by the diagram below. 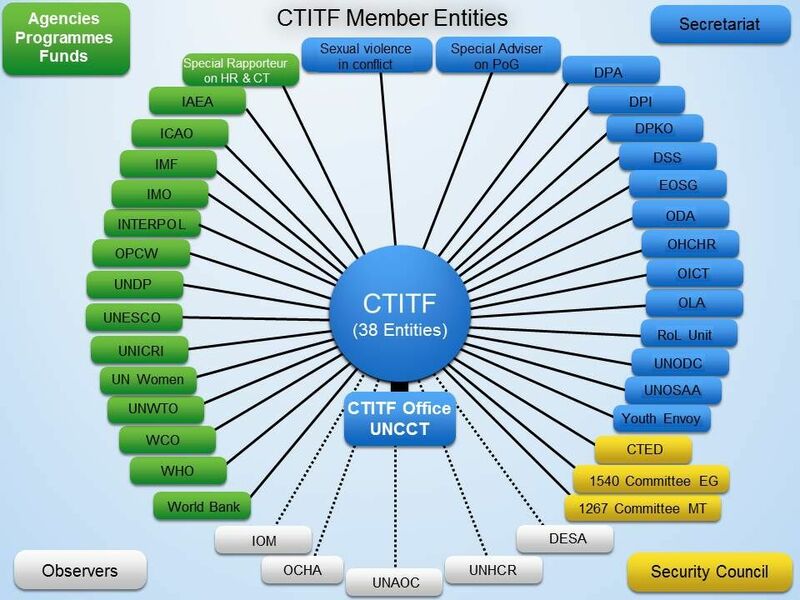 The UN Secretariat, agencies, funds, programmes and affiliated organisations all contribute through their individual mandates and through membership of the Counter-Terrorism Implementation Task Force (CTITF). Kofi Annan’s proposed definition at the UN in 2005: “any action constitutes terrorism if it is intended to cause death or serious bodily harm to civilians or non-combatants, with the purpose of intimidating a population or compelling a Government or an international organization to do or abstain from doing any act.” The definition was not adopted. We will get to the reasons why later. Why did Kofi Annan fail in his definition of terrorism? There are legal instruments combating terrorism, there are committees and specialised agencies setup to combat terrorism, but there is no definition of terrorism. The definition was not adopted. It was not adopted because of disagreements regarding state terrorism and foreign occupation, as well as the difference between terrorism and the struggle for self-determination. I will examine these disagreements in a separate article soon.